Prime angora is hand plucked from the rabbit. The fiber is usually combed first to free it from any tangles or mats. After it has been plucked, the staples are kept parallel so that it will be easy to draft during spinning. Prime angora can be carded, but it really isn’t necessary. This breed is probably the cutest and most distinctive because of its long heavy fur that covers its ears and face. 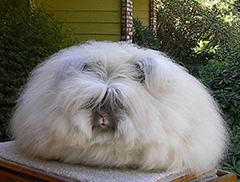 In full coat, their bunny features are covered and sometimes they are mistaken to be small dogs (or a relative of “Cousin It”). The wool is silky and fine which makes it very soft. 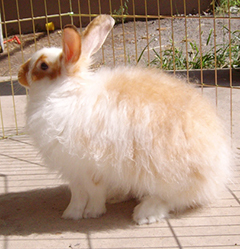 The English Angora comes in white and a variety of beautiful colors. The coat is characterized by having little guard hair in proportion to its wool, and wraps rather tightly when spun, with relatively minimal fluffing. It is smallest breed of the four, weighing 5 to 7 1/2 pounds at maturity. 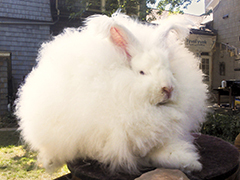 The German Angora, is recognizable, mainly because of its’ size and popular among handspinners because of the large amounts of fiber they can produce. I once had a doe that gave me 12oz of fiber each time she was harvested. 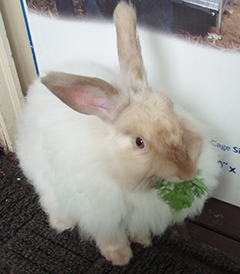 A purebred German Angora is only white and colored hybrids (pictured) are considered to be cross-breeds. They have dense wool because of their double undercoat and it is usually sheared, since it rarely molts. Their fiber does not “halo” as much, in spun yarn, like the other breeds. 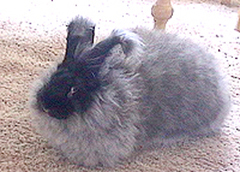 The German Angora has a mature weight between 9-12 pounds.